Santo Domingo is the Dominican Republic's capital city. Founded in 1496, it is the oldest European settlement existing in the New World. In 1978 the Dominican Republic was opened to Mormon missionaries. By 1986 membership had grown to eleven thousand and in 1998, LDS Church membership reached sixty thousand. Before the temple was built in the Dominican Republic, members of the church traveled to Peru, Guatemala, or the U.S. state of Florida to attend a temple. Coordinates: 18°27′59.64120″N 69°55′1.718399″W﻿ / ﻿18.4665670000°N 69.91714399972°W﻿ / 18.4665670000; -69.91714399972 The Santo Domingo Dominican Republic Temple is the 99th operating temple of The Church of Jesus Christ of Latter-day Saints (LDS Church). It was the first temple to be built in the church's Caribbean area. The temple was announced on December 4, 1993. On August 18, 1996, Richard G. Scott of the Quorum of the Twelve presided over the groundbreaking, marking the beginning of construction. When construction was completed, a public open house was held from August 26 to September 9, 2000, attracting nearly forty thousand people. Over ten thousand church members from the Dominican Republic and their neighbors from Haiti, Puerto Rico, and other islands witnessed the dedication of the temple on September 17, 2000 by LDS Church president Gordon B. Hinckley. 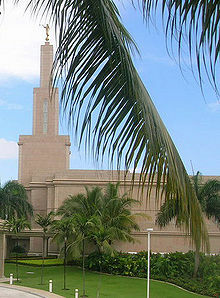 The Santo Domingo Dominican Republic Temple is located in the western part of the city. It is built on a rise that has kept it dry when other parts of the city were flooded. The site is adorned with trees and overlooks the Caribbean Sea. It has a total of 67,000 square feet (6,200 m2), four ordinance rooms, and four sealing rooms. The temple district comprises the stakes and districts of the Caribbean on an arc from Haiti to Trinidad and Tobago, as well as those based in Guyana and Suriname. However, members of the church may visit and use any temple in the world. The Port-au-Prince Haiti Temple when it is completed will take some of the stakes and districts from the Santo Domingo Temple, primarily those in Haiti. As most workers at this temple are Spanish-speaking Dominicans, patrons requiring services in a language other than Spanish would be well-advised to notify the temple before arriving. Adjacent to the temple is a hostel operated by the church. Its intent is to provide overnight accommodations to patrons who cannot return to their homes the same day they attend the temple. A kitchen and dining area are available for the use by patrons, but the hostel does not include a cafeteria (though restaurants and grocery stores are within walking distance). In 2012, a researcher revealed that Anne Frank had been baptized for the dead in the Santo Domingo Dominican Republic Temple, in violation of a 1995 agreement between the church and Jewish groups that the church would no longer posthumously baptize Holocaust victims. In response, the church stated that the member that submitted the name for baptism would lose their submission privileges and that other disciplinary action would be considered. ^ "Santo Domingo Dominican Republic Temple District". Retrieved June 8, 2015. ^ "About the Dominican Republic MTC", lds.org, 2015-06-09. ^ Andrea Stone, "Mormon Baptism Targets Anne Frank—Again", Huffington Post, February 21, 2012. ^ "Church Statement on Violations of Proxy Baptism Policy", mormonnewsroom.org, February 21, 2012.